The center of any tight-knit rural community is its schools. This holds true in Vernonia, where the new K-12 school campus is quite unlike any other in Oregon or the nation. A major flood damaged much of the town in 2007, and left the schools in dire need of repair. But residents banded together to turn this natural disaster into a powerful opportunity. Residents rallied behind a vision for education in Vernonia that would tie to the area’s rich natural resource-based history and heritage and connect to a sustainable future. In 2009, district residents overwhelmingly passed a bond measure to provide the down payment toward rebuilding the entire K-12 school district in a safe, central spot on higher ground. The community’s vision included designing an integrated building that would serve as a model for rural sustainability and also become a “living laboratory,” connecting students to the surrounding ecosystem. The new campus opened in August 2012 with a community event that brought leaders from across the state to Vernonia to help celebrate the momentous occasion. After three years of operation, the school district announced at a May 2015 event that the campus had received a remarkable recognition. 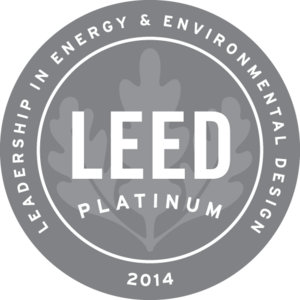 Vernonia has become the first LEED® (Leadership in Energy and Environmental Design™) Platinum certified integrated K-12 campus in the nation. At the same time, the district announced that the school had also received a dual certification from the Green Building Initiative’s Green Globes program, with three out of four globes. 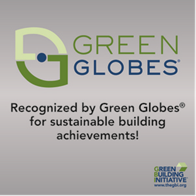 Green Globes is an emerging alternative to LEED that has recently been approved by the U.S. General Services Administration for federal ratings. Points were earned for utilizing renewable energy resources, reusing and recycling building materials, improving the efficiency and performance of the building to reduce environmental impact, improving sustainable practices within the building, and many other efforts. The new Vernonia K–12 Schools were designed and built to meet today’s classroom needs. There is the capacity to expand the school to serve up to 1,000 students—enough room to accommodate 30 years of population growth. The design includes integrated Kindergarten through 12th grade facilities, with a highly compact layout that minimizes cross-traffic among the youngest and oldest students and maximizes energy efficiency. The building has been sited to provide for optimal solar orientation and natural ventilation, allowing for significant day lighting and reduced energy use. 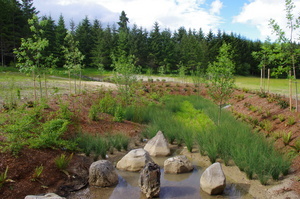 The site has been engineered with constructed wetlands and bioswales which treat, store and send all storm water for release into the nearby Nehalem River. Some of the sustainability features in the building include radiant in-floor heating and cooling; heating from local biomass fuel; local materials and labor; and wetland education features. Building energy use is monitored as part of a new curriculum focused on natural resources. Overall, annual energy efficiencies will result in long-term operational savings for the school district. The learning environment is critical to the success of students. And inside and outside of the school’s walls, Vernonia is forging innovative partnerships with higher education institutions and local businesses to conduct research and develop sustainable programs and learning opportunities for students. As the home of the Oregon Solutions program, Portland State University has been an integral part of the Vernonia story. Oregon Solutions helped the district throughout the siting and new school development process, coordinated a PSU intern-led community vision effort and has helped develop the concept and programs involved with the Vernonia Rural Sustainability Center (VRSC). PSU professors attended a collaborative campus tour, and used the work being done in Vernonia as part of their students’ research projects. Oregon Solutions continues to play a major role in the resource development efforts tied to the new K-12 school and supporting the recovery efforts in Vernonia. Oregon State University faculty have been involved in the Oregon Solutions process since the beginning. They have performed professor tours and completed a baseline “Vernonia Vitality” study to determine the impacts and successes of how a rural town rises from the effects of two natural disasters. 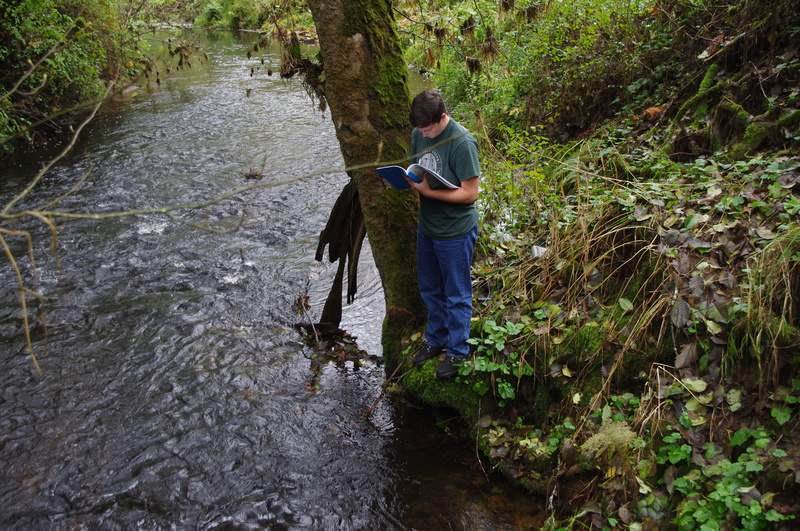 Vernonia collaborated with the OSU Extension Service, Knappa High School, Philomath High School and several others to develop the curriculum for its forestry program. This program also has a connection with the local timber industry. Hancock Timber Management and Weyerhaeuser both have partnered with the forestry program, supporting the students with real work experiences as they learn about forestry and timber management. Vernonia High School offers a natural resources curriculum, working with the Oregon Natural Resources Education Program through OSU to enhance the classroom experience by utilizing these resources, providing students with an opportunity to earn this new certification. University of Oregon has also been an integral part of the Oregon Solutions process by collaborating on, and conducting, a basic feasibility study to determine the Vernonia Rural Sustainability Center scope and audience. Another critical partner in helping the school district move forward after the flood has been Portland Community College. They have provided technical support with grant writing, community survey development and implementation of natural resources projects. Students in PCC’s Landscape Technology course engineered a landscape plan for a portion of the new campus that includes a bioswale. This was the first area to be landscaped by students, and it serves as a model for students who will undertake their own native plant landscaping projects in the future. Vernonia has achieved its vision for sustainable schools quite unlike any other, with national certification recognizing its leadership. This timber town’s school and community center is creating a new model for other rural towns across Oregon and the Northwest. Previous PostThe Life of a Vernonia CommuterNext PostStub Stewart State Park: Come Play!